I don’t think I can adequately express just how happy—no, elated—I am about today. Sure, it’s Tuesday, which isn’t something to typically get all wound up over, and yes, I still had to go to work today rather than enact my plan of sitting around in a bathrobe while watching the entire Star Wars saga at once. But…but…it’s Election Day here in the great Commonwealth of Kentucky! What’s the big deal, you ask? Well, of course, there’s that whole expressing your individualized will as toward goverance thing, which is pretty cool, even if most of the candidates might only be slightly more electable based on their honesty and trustworthiness than your average potted cactus. Even beyond that, though, I’m tinkled pink about the arrival of election day because aside from some unfortunate restrictions on when you can buy alcohol today (making it the clear bane of all pub owners), it means I can finally express a great sigh of relief and move on with my life. I know I already complained about this a few days ago, so I’ll spare you the recap rant. But I wanted to point out that what I photographed above is only from Monday’s mail. Yes, fair reader, every single last one of those ads pictured above was stuffed into my groaning mailbox yesterday. 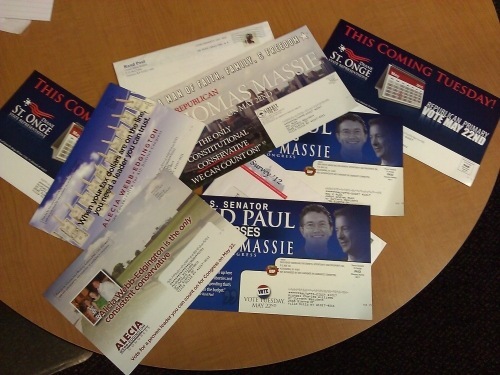 I haven’t counted yet, but I’m pretty sure that brings the total of this season’s political fliers to 1,653,258. Or does it just seem like that many? Whatever it is, I worry somewhat about having received so many over the course of the last few weeks. Surely the attention I’ve been getting by flier isn’t typical, right? Am I some kind of superhero voter, perhaps? Does my vote count more than the average American? Well, whatever, I look forward to an emptier mailbox. So, you’ve done your civic duty, right? It’s not too late, you know. Get out there and cast your vote!